More than twenty-five years ago, Chelsea Quinn Yarbro and her friends began sharing messages from a group entity that called themselves "Michael". Michael's words were offered without alteration or interpretation for seekers, students, and skeptics alike. Pragmatic, insightful, and often witty, Michael insisted their work was simply to help questioners become more aware and better able to make their own decisions in life. Through this initial volume, Messages From Michael, and three more that followed, Michael spoke to thousands who found new understandings of themselves. Unfortunately imitators and frauds have since exploited the Michael teachings -- but even they admit that Messages From Michael was the first source of the teachings. After Messages from Michael was published more than thirty years ago, there was a demand for more information. 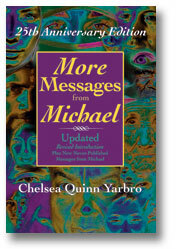 The second book, More Messages from Michael was published soon after. In More Messages from Michael, Mid-Causal entity Michael delves more deeply into life choices, reincarnation, the working of the soul's evolution, and the nature of living, Michael answers many questions ranging from the most mundane to the highly esoteric. Michael's teaching, which remains consistent to this day, is both practical and unearthly, delivered with dry wit and idiosyncratic English, filled with insights, information, and a unique perspective that has kept people coming back for more for over three decades. Just keep in mind Michael's admonitions: Belief is not required, All is chosen, and All choices are equally valid, and you may find that Michael's teaching has a message for you. A long-awaited twenty-fifth anniversary edition of the first ground-breaking book, expanded for the twenty-first century, was published a few years ago. 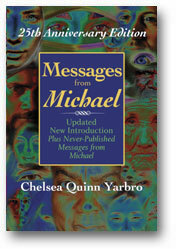 A new edition of the second book in the series, More Messages From Michael is also available. Learn more about Michael and the new editions of the Michael books by using the menu to the left. You can purchase Messages From Michael or More Messages From Michael in many fine bookstores as well as through online booksellers or as a PDF ebook direct from the publisher.